Wonder Woman, Lois and Jonathan watch Superman and Doomsday fight from the safety of the Watchtower. On Earth Doomsday tears into the paramilitary types that landed at the end of the previous issue. The man in the hooded robe notes that the soldiers were not up to the task of taking out Doomsday. Superman slams into Doomsday and throws him into a nearby forest. They continue to fight and Superman once again throws the creature, this time towards his personal Fortress of Solitude. There he tries to send Doomsday into the Phantom Zone but he can't get enough time to set his trap. Wonder Woman arrives after Lois tells her to leave and help Superman and gives the Man of Steel the time he needs to set up the projector and send Doomsday to the Zone. Back in Metropolis Clark and Lex tend to the wounded. Superman arrives and wants a word with Lex. Superman isn't happy that Lex is wearing the symbol but listens as Lex explains his reasons for becoming a hero. The two aren't allies...yet. Back at the Fortress Superman is reunited with his wife and son and they head home. Meanwhile the man in the hooded robes muses that Superman was quite right to send Doomsday to the Phantom Zone. The act was ultimately futile because the man intercepted the projection and now Doomsday is his. Story - 5: This final chapter of PATH OF DOOM was very satisfying on all levels. The action was great. The characterization was great. There were some neat twists and turns and it was dramatic. Plus, it had a great last page which told us that while it's over it is certainly not over. One of the main criticisms that people had for the initial chapters of this storyline is that Superman seemed to be acting first and thinking second. To be fair Superman did jump the gun slightly with Lex Luthor but to me this makes sense considering the fact that Lex has always been a hot button issue with Clark. In any case whatever "punch first, ask questions later" problems people may have had were put to rest over the next five installments especially in this issue. While Superman did a fair amount of punching and throwing Jurgens wrote him as a very intelligent fighter with every strike leading him to his ultimate plan of getting rid of Doomsday. I liked this because I hate when Superman is treated as nothing more than a pair of fists in a cape. The scenes on the Watchtower were spot on. I loved that Lois all but kicked Wonder Woman out of the tower so she could go help Superman which led to that fist pumping moment of her showing up to give Superman the time he needed to get the Phantom Zone projector into place. The cherry on the top of the scene was Superman and Wonder Woman shaking hands when the battle was over. Call me old fashioned but I like then my heroes get along. Yes, I am aware that Superman and Wonder Woman got along during the New 52. They got along rather well. I was speaking in generalizations and as we all know generalizations are always bad. The scene at the end with Lex was also enjoyable. For the past decade or so DC has done a lot to make Lex a more relatable villain and for the most part I have balked at that idea. I don't want my villains to be two dimensional but at the same time I don't want their motivations to be so relatable that I start wondering why they're a villain in the first place. When it was announced that Lex was going to be a Superman in this brave new world I rolled my eyes and assumed that it would be more of the "he's not really a bad guy and Superman could seriously be a threat" type of thing. This story in general and this page where Lex and Superman have their chat in particular have shown me that this time it really is different. Even though his motives are selfish this Lex wants to be a hero and because I buy into that the moment he falls and becomes the villain again will have more impact. I could have done without the "a human being will inspire humanity, not some alien" rhetoric but that's Lex so at least it felt authentic. So here we are at the end of the first Rebirth storyline in ACTION and I could not be happier. Dan Jurgens has given us six amazing issues and I can only assume that the best is yet to come. Not only did we get a very satisfying Doomsday/Superman slugfest but we have the whole thing with Lex, this mysterious Clark Kent and the hooded man that I assume is Mr. Oz pulling the strings in the background. 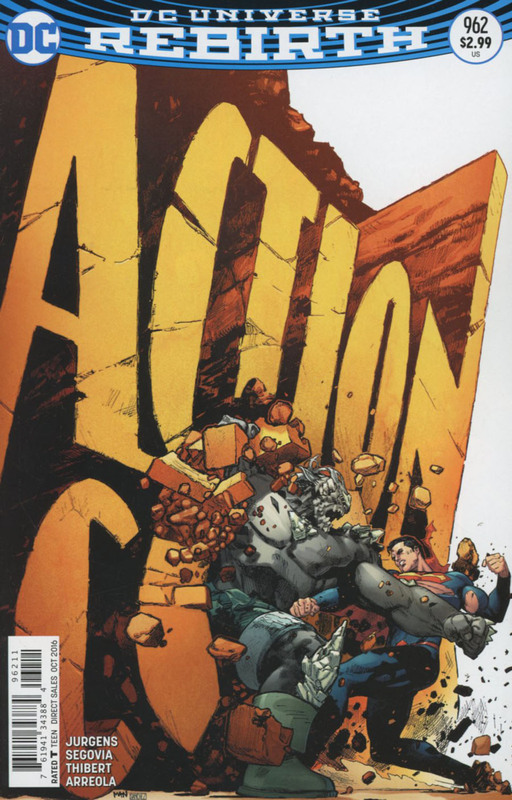 ACTION COMICS is back on track but more importantly Superman is back on track as well. I can't wait for the next issue. Art - 4: After a rough first page (Lois and Wonder Woman's faces are a bit off in the first few panels) the art is just as enjoyable as the previous issue. Segovia and Thibert made for a very good team and I love their sleek style. Superman looked like a boss throughout the issue and the action was amazing. They also put a lot of character into their work. The expression on Lois' face when she tells Wonder Woman to help Superman is a good example of this. The art, like the writing, worked for me on every level. I hope these two are in the rotation for the near future. 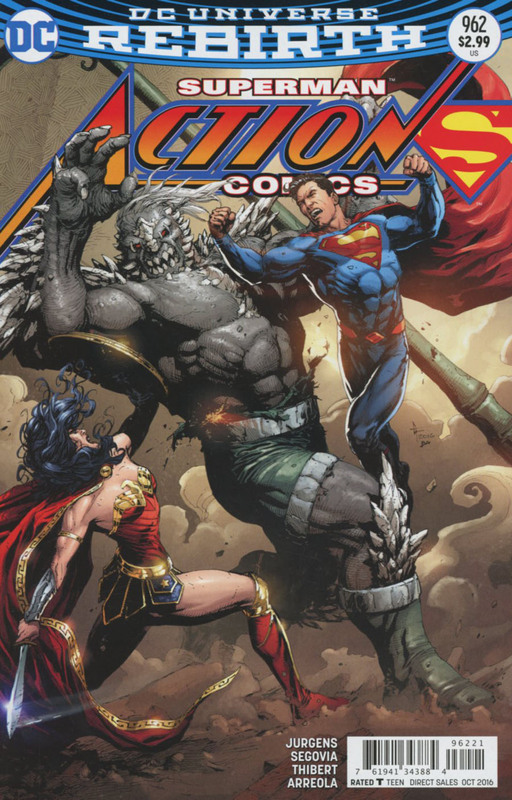 Cover Art - 4: I love that Superman and Doomsday are fighting through the very stylized logo. It's dramatic and eye catching. We don't get a whole lot of detail on Superman or Doomsday but that is a very minor quibble. Variant Cover Art - 5: Another fantastic variant. Doomsday is very on model and I like the expression on Wonder Woman's face as she slashes into the monster.